Use a single piston caliper and rotor for a 69 Camaro or from my list of donor cars, they are all single piston. You need a caliper mounting bracket, brake hoses, pads, bearings. You don't need the two piece rotor and hub like the origonal 69 used. The Monte and Nova used a one piece cast hub and rotor. Your drum booster should work, use a disc brake master cylinder. Get a 1970 or newer one piece combination brake valve and mount it under your master cyl. Take off your old brake warning switch, replace with the Combination valve. 2. F/R pressure differential warning (Used on some disc and some drum brake Camaros, usually on front-heavy models like BB engine and AC cars. The "combination" valve contains all these funcitons for a 1970 and later Disc/drum brake car. For use with four wheel discs, an adjustable rear proportioning valve may or may not be needed. The brown brake light warning wire plugs into the combination valve. 1. METERING- holds back pressure to the discs until 40 psi is reached, so the rear brakes can overcome the return spinings and take up slack. Keeps front from grabbing under VERY LOW PEDAL PRESSURES ONLY, LIKE WHEN YOU ARE ON ICE OR VERY SLIPPERY SURFACES. Once you are over 40 psi line pressure there is no benefit to having this valve. 2. PRESSURE DIFFERENTIAL WARNING SWITCH -same as drum, senses differences in front to rear pressure, warns of leak by turning on a brake warning light on the dash. 3. PROPORTIONING- reduces rear pressure to balance front to rear traction. fronts should lock first. A stock front disc 67-69 Camaro uses separate valves for each function above. 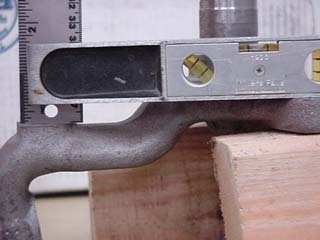 Some do not use the proportoning valve down on the frame rail. Here is an explanation of the stock first gen proportoning valve. NOTE: If you won't be driving on snow or ice, there is no great need for a Metering valve, many Camaros drive fine without them. Just use an adjustable proportioning valve in the rear brake line. Many drum systems have a residual pressure valve (a little piece of rubber the size of an eraiser tip) in the master cyl outlet just behind the little brass seat where the brake line screws in. It maintains a slight (10 to 15lb) pressure to keep the wheel cyl cup seals inflated. Drum master cylinders also lack enough stroke and/or enough reservoir volume to properly operate disc brakes. WARNING- most discs do not use a residual pressure valve (RPV). Some aftermarket disc systems use a 2lb RPV which is OK, it helps pedal height. caliper seal design is a main factor in RPV requirement. Drum brake systems use: a brake pressure warning switch/distribution block only, with some models using a proportioning valve attached to the frame under the drivers seat area. And a RPV in the master cyl outlet. 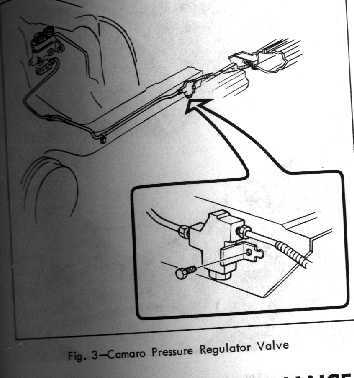 Disc brake Camaros use: NO residual pressure valve in the disc side of the master cyl. The drum side often has a RPV. A round metering valve with rubber push button, by the master cyl, and a Proportioning valve on the frame rail. Also a brake pressure warning switch under the master. Early Vette four wheel disc and Camaro JL8 systems use: NO RPV, NO Metering valve, they do not use a proportioning valve on the 69 Camaro JL8 four wheel disc system. When swapping master cyls, there are at least two different length master cyl push rods coming OUT of the booster. To fit different depth master cyls. The rod can be removed from the booster by pulling on it. It has an O ring on it. If the master cyl you get is deeper where the pushrod goes, you either have to swap the pushrod, or you can cut a length of rod or bolt and put it inside the master cyl to make it the same as the shorter drum brake master cyl. If the rod is too long you can cut it. UNDER NO CIRCUMSTANCES USE A SHORT DEPTH MASTER ON A MANUAL SYSTEM. THE PUSHROD CAN FALL OUT AND YOU WILL HAVE NO BRAKES! If the push rod is the wrong length, your brakes will lock or not work at all! With stock calipers, use a 1 1/8" master cyl bore size master cyl on a power disc system. A 1" bore on a manual brake system. Make shure the master cyl piston returns all the way or it won't uncover the replensihment port to the reservoir. The rear pushrod hole in the booster must be open to the air. I have heard of people swapping to power brakes and transfering the manual brake rubber boot to the power booster. THIS WILL PREVENT THE BOOSTER FROM WORKING. There is a felt pad in the booster around the pushrod to keep noise down. That is all that should be in there. For road racing they remove the pad for faster brake actuation. I haven't done it, but you can cut with a hacksaw about .610 inch (see photo ) off the top boss where the brake anchor pin is located, and grind it flat. A regular bolt will bolt the caliper bracket to this hole. Get one piece rotors that have the hub and rotor cast as one piece. (71 Monte Carlo). Buy brake caliper mounting brackets, get rebuilt calipers, get a disc brake master cyl, (1" for manual, 1 1/8" for power, and a proportioning (combination) valve. I used a Monte Carlo disc setup on my 67 Camaro, it included the spindle. I did this to my friend's 68 Camaro, only we put the Corvette calipers and rotors on the front. We started with the single piston bracket, and drilled holes and cut the bracket to fit the 67 Corvette caliper. The Corvette rotor is bigger, 1 1/4" X 12" and fits right on the Camaro DRUM brake hub! Neat huh? 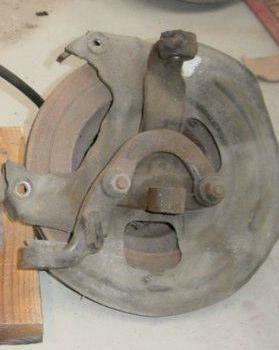 You can use the spindle, caliper, bracket, or rotor from the below models IF the car came with front disc brakes. Drum spindles can be modified to disc use by cutting the upper boss. They must be disc brake equipped of course. I believe discs became standard in 1970. Some of the cars listed have the caliper forward of the spindle. 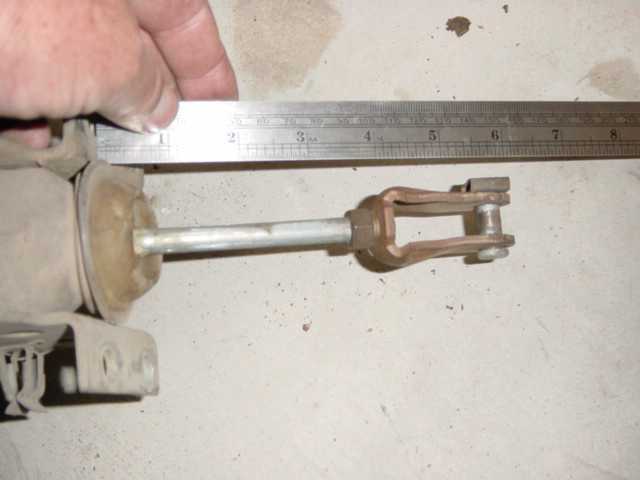 If so, you must swap side for side placing the Caliper to the rear of the spindle on the Camaro. When swapping from front steer cars, use your Camaro steering arms. This is a very complete list. I see the GMC Sprint is listed, I think the El Camino of the same year should fit too. Chevy (GM) didn't make the rims - they were contract manufactured mainly by Kelsy-Hayes Corp. during the 60's and 70's and yes, they made lots of different rims those first years of discs that will only work with drums. The codes for wheels that will fit with Disc barakes are way to many to list here and really most wheels off post 1970 cars will fit disc brake cars as discs became standard then. I have listed several of the codes from my pocket cheat-sheet that I look for when I come across swap meet wheels that may be of help to you in you search. Most of these codes come from 68-70 cars so at least you have a starting point. These are not just 'Rally' codes, some are plain type wheels that will work with discs. Following are my thoughts on what affects braking performance of a first gen Camaro. I'm sure there is more to it than is listed here, but it's a start. The brake pads on a stock 69 Camaro are larger than many aftermarket brakes. Although the pad size does not add braking power it does add to pad life and lowers the pad temps to some degree. Any given pressure on a brake pad acts on the rotor. If you double the pad size, at the same line pressure the pounds per square inch load on the pads would be cut in half, so there is no gain in braking torque by using larger brake pads. If the rotor is exchanged for a bigger diamiter, you get more braking torque for a given pedal pressure. Of course the braking limit is the tire's coefficient of friction against the road. If a shorter tire height is used, the calipers gain leverage over the tire. A larger rotor does the same. The same amount of heat is generated for a given stop. Deceleration G force = heat. More G = more heat. More vehicle mass = more heat. The shorter the stop, the shorter the time available for the brakes to dissipate the heat. 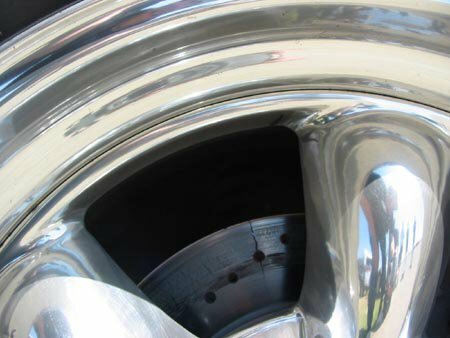 The shorter the stop the less help you get from the cars rolling resistance and aerodynamic resistance. = Heat "load" increases. The shorter the stop the more work done by the FRONT brakes due to forward weight transfer. More mass in the rotor = increased ability to absorb the heat generated. Eventually the rotor will heat up but by then you have stopped, or are on the next straght away. A smaller rotor will heat up quickly due to low mass and will have a reduced aility to reject heat to the air (less fin surface, or even none). The rotor should not heat above the pad's operating temperature. More cooling fins, as in a wider rotor, means more heat can be rejected or thrown off by the rotor. In Winston Cup, they run thin rotors with light calipers on super speedways as they don't brake much. On short tracks like Martinsville, rotors really heat up because they don't have time to cool. It's accelerate, brake accelerate, brake over and over. They use the heavy rotors, lots of fins, and big calipers with several cooling ducts. A heavier Camaro or one with a bigblock engine would get into braking trouble sooner. Higher brake pressures are required. 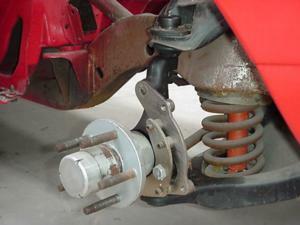 In some cases the car might be lowered too much and gets onto the bump stops under braking. Usually, one side will lock and the driver will let up on the brakes, the braking distance then goes way up. This was a real problem on my 85 and 89 Camaros. And they were not lowered! The tires have a lot to do with braking performance, as you cannot brake beyond the traction coefficient of the tires. There's lots more to this subject. I suggest you buy a book and read up on brakes if you are planing on improving your Camaro's braking system. On the left is the long 4 inch pushrod, On the right is the 2 5/8" short pushrod, a difference of 1 3/8". Note the O ring to seal vaccum. The matching master cylinders are below. Deep hole 1 5/8" on left is for manual brakes, OR is used on power brakes with the long pushrod. The cyl on the right is POWER BRAKES ONLY, 3/8" depth hole, the pushrod attached to the brake pedal arm will fall out if used on a manual system. Measuring depth with my dial calipers, the deep master cyl is 1.350" deeper than the shallow. A manual brake pushrod is aprox 7" from tip to clevis pin. 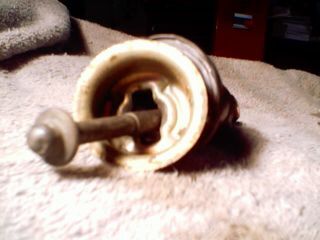 Above is a later model GM car pushrod and cup for use with a shallow master cyl and manual brakes. This may be useful in allowing use of shallow master cyls on first gen Camaros, but deep hole master cyls ARE available for manual use. The booster pushrod should be about 5 3/4" to 5 7/8" long from booster upper mounting hole to clevis pin hole center. The brake pedal has a metal piece bolted through the upper pushrod hole used for manual brakes, the tab extends down to actuate the brake light switch. This bracket is about 3/4" from the brake pedal edge. The rubber bumper looks taller than a manual brake car, but I don't have one to compare to. It looks like GM used a clutch pedal rubber bumper in that position. The brake pedal is between 4" and 4 1/2" from floor kickup to lower edge of brake pedal. To confirm the above measurements, I measured my parts, here is what I found. The booster on my 67 which is on the car has a pushrod length of 5.5" long from inside the firewall to brake pedal clevis pin. The pedal to floor measurement is 3.75" with all the firewall padding, carpet and a thin floor mat in place. I measured level running forward from the bottom edge of the brake pedal to floor, actually to near where the pedal would hit the floor if it swung all the way down. I have a 67 and a 69 booster out of the car, that is 5.75" long. There is no way you are going to drive a Camaro heel-and-toe without raising the gas pedal height, it should be just below the brake pedal height when the brakes are on hard. I haven't done mine yet but will add more info when I do. My camera autofocus had trouble with this shot. 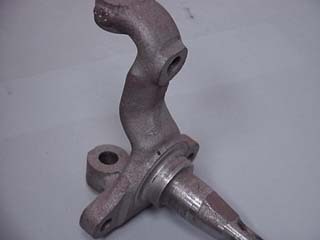 Here is a photo of a first gen spindle and steering arm. Notice the steering arm is well below the lower ball joint! Chevelle and other front steer steering arms are much higher up and will not work on a Camaro. Note also the caliper and steering arm are on the same side (rear) of the spindle. If you wrongly position the caliper bracket to the front, the caliper can hit the sway bar, and the brake hose will be exposed to damage. THE CAMARO DISC BRAKE SPINDLE REVEALED! I've gotten a lot of questions about the difference between a Camaro disc brake spindle and a drum brake spindle. On the left, you can see the upper bolt hole boss is between .400 to .480" SHORTER than the lower mount.holes, the disc spindle is TALLER than the lower flange. I have two spindles and one is .400" and the other is .480" . The hole size is the same as a drum spindle, and the threads start at the face of the upper mount. I have been t old by others the drum brake spindle boss is around .610" taller than the disc brake spindle. If you shorten your drum brake spindle by .610" the disc components should fit. I don't have a drum brake spindle to measure so I can't verify that measurement. Left photo shows the threads a little. If you have a drum brake spindle , you can cut the upper mount down like this one, and you are set! These calipers are similar to, but different than a Corvette. They use a the two piece hub/rotor. These are no longer serviced as a two piece unit, they are available in a one piece type. The spindles measure 7 1/8" from top ball joint pad to bottom ball joint pad. Below is our 69 Camaro Vintage racer with a taller Stock Car Procucts spindle, and NASCAR hub with 5/8" studs. Screw in lower ball joints and larger upper ball joint. 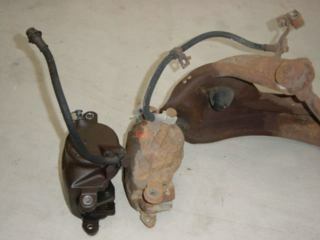 Here's a comparison between a Monte Carlo (Left) caliper and a stock Camaro caliper (right). The 69 hose comes out near the top and has a clip that bolts to the upper A frame lip just back from the ball joint. You can see two holes, one for the bolt the other for the clip to hook on to keep it from rotating. The Monte Carlo caliper has a hose that is shorter and comes out at the bottom of the caliper. I used the Monte Carlo caliper on my 67 but the brake hose caliper fitting rubbed my bump stop a little. 67 bump stops are different than 68, and 69 is different again. Notes: These edge codes are located on the edge of the friction material of every brake pad by government regulation, along with some other codes. The first letter is a grading of the C.F. at 250 F and the second letter is a grading of the material at 600 F. Each letter grade can actually have quite a range of C.F. But a difference in the letter grade from medium to hot temperature could be an indicator of fade. The letters can be in any order. Therefore FE pads fade when hot, and EF pads would not grab when cold.. Also, you should know that Steel on Steel has a C.F. of 0.25!! So EE pads have only marginally more torque than no pads at all! Therefore FF pads are usually considered the minimum for a high-performance pad. Cracks can happen, drilling your rotors can cause rotor failure if your brake rotors get hot. Those calipers self-adjust by the applicaton of the emergency brake. If your E-brake is not operational, they won't adjust themselves. In addition, those calipers are known to have problems with the self adjusters not working. The adjster is inside the caliper piston and the piston can be changed, but it is a pretty difficult job to do. I'd recomend swapping for a rebuilt caliper if you find yours to be bad. There is also a small anti-rotation spring on the piston that must be in it's proper position and must not be in the way of the pad. Another area to consider is the axle end play. If you have positraction there is less end play, the non-posi units have too much end play and should be shimmed to reduce it to something close to .030". Shim behind the axle C clips with machined washers similar to valve spring washers. The symptom of too much axle end play is: the pedal feels ok sitting still, but when driven the pedal is low due to pad knock back caused by the excessive end play.